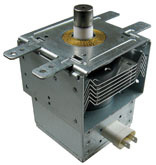 ERP 10QBP0239 Microwave Oven Magnetron. Fits many makes and models of microwave ovens. Exact replacement for 5600103 and LG 2B71165N. See SPEC IMAGE for more details.